"It's like traveling for a long time to reach a destination, and finding yourself at the edge of a deep canyon with no way to continue to the other side." When Kathleen and Bruce Martin created their endowed scholarship, this was a very real image for them. During her career at RIT, Kathleen had seen countless students work for two years, three years, or longer to get their degrees, only to reach a point where their tuition funding ran out. Close to finishing, they now faced losing all they'd worked for. "I've seen students - because of limited loans, family illnesses, job losses, etc. - find themselves unable to pay for their last few semesters of college," says Kathleen. "That affected me deeply, and it's why we wanted to create this scholarship. 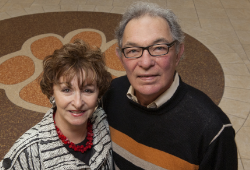 Kathleen and Bruce knew they were in a position to help these students. They used IRA distributions to create the Martin Family Endowed Scholarship. Through a Charitable IRA rollover, they were allowed to exclude their distribution from their taxable income, but still have it count toward their required minimum distribution (RMD). And the distribution created tuition support for students in jeopardy of not completing their degrees.